When it comes to designing a space, most of you can get a bit overwhelmed. Where do you begin? How do you hone in on what the overall look and feel will be? What color scheme do you go with? Anytime I start on a new project, I like to create an inspiration board first. Most of the time I begin with what I call a "lead" fabric - one with a pattern or design - and the colors, texture and overall style of the pattern often determine the direction I take an entire house. 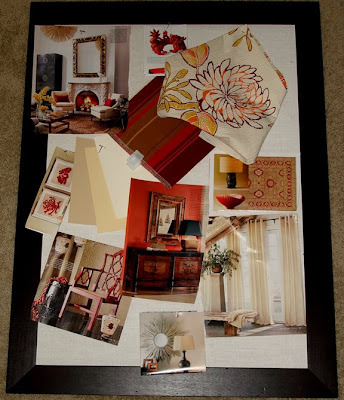 I pin the fabric on a board and go through magazines and catalogues in search of a theme photo - a room scene that best represents my design concept. From there I'll add paint chips, wood finish samples, tear sheets - anything that moves me. I'll keep the board nearby throughout the design process so I can refer to it anytime I need more inspiration. Try it next time you decide to design a single room or your whole house! great tip & i love this board!